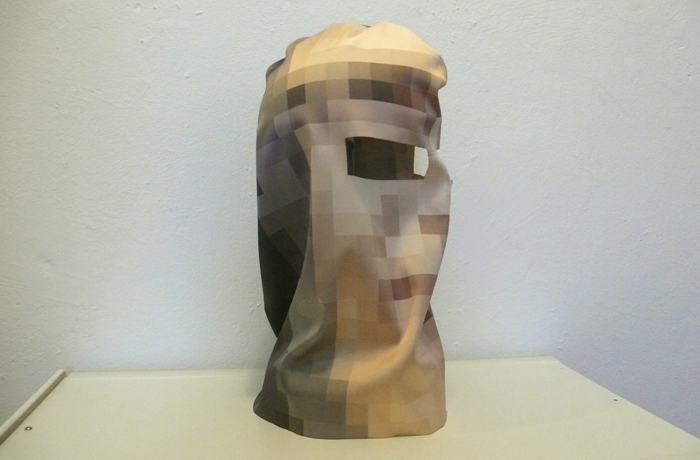 “Pixelhead is a simple balaclava made with an elastic fabric very similar to swimsuit material. Its aesthetic appearance, however, is quite specific: the decorative pattern chosen by Martin Backes is indeed “pixelated” and the colour palette is similar to those that a face or a head shot would have if photographed by a digital camera. Pixelhead has been created as a garment for urban survival: worn in the daily hustle and bustle it makes faces unidentifiable if pictured or recorded by surveillance cameras. Intuitively we could describe this object as “camouflage.” This definition, however, has in itself a surprising reversal of perspective. The ancient concept of mimesis is in fact that of imitation of nature and the world. But Pixelhead operates its mimesis towards an environment that is not natural anymore. Being “mimetic” in this project means, instead, to emphasize a profound and urgent transformation: to defend our privacy in (physical) reality we must adapt as much as possible to the technologies of control, implemented in the thousand eyes of the machines looking at us. Those eyes are a constant and continuous filter through which everything is read, encrypted and processed. Bougon stated: “Inspired by a customer, I wanted to show that women with rolls, bumps, lumps, scars, stretch marks, surgery scars and natural breasts that have nursed babies can be stunning and beautiful.” And women have responded in full-force, posting their own photos to Curvy Girl’s Facebook page in high numbers.